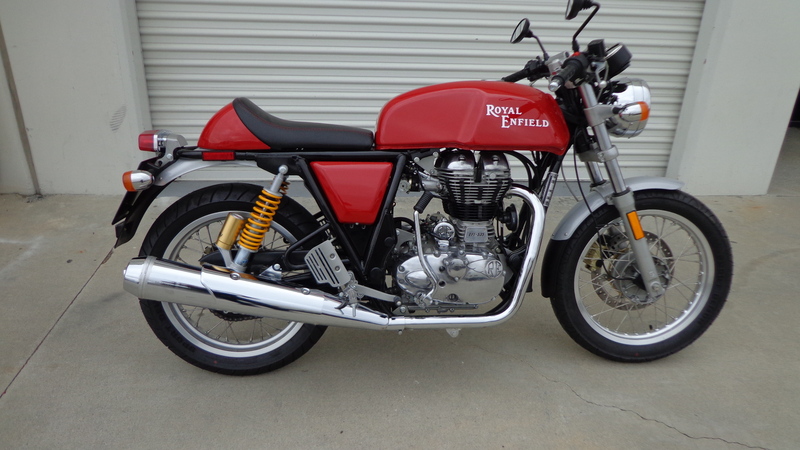 I have been waiting since November 2013 for the Royal Enfield’s to come into the country and here it is in may and I find out that Today I shall take charge of my machine. This little Bike is a quite a bit of an improvement on the earlier models and having a new re-engineered power plant that now produces 535cc, which of course is not going to rip your arms off but, is a better built motor than the ones of past, thus said is a fun ride that when you first kick it in the guts, the motor will jump into life and have that deep long stroking sewing machine sound that I have not heard in many years. But let me emphasize something right out of the gate on this Blog- although this is a cool Classic cafe racer styled machine, it is not going to be a Ton Up machine in this guise, this is a fantastic town bike and journeys are fin but topping out at the 80mph mark may not be what you are wanting, But- in all that said, this is a superb machine at a really really affordable price, I shall will make sure that once all run in, this machine of mine will hit the TON with a few engine mods, but for value for money this is awesome. I have a Thruxton if i want to go crazy and get my earole scrapping the tarmac and this is something I really wanted as it has so many classic lines, how can you not love it? 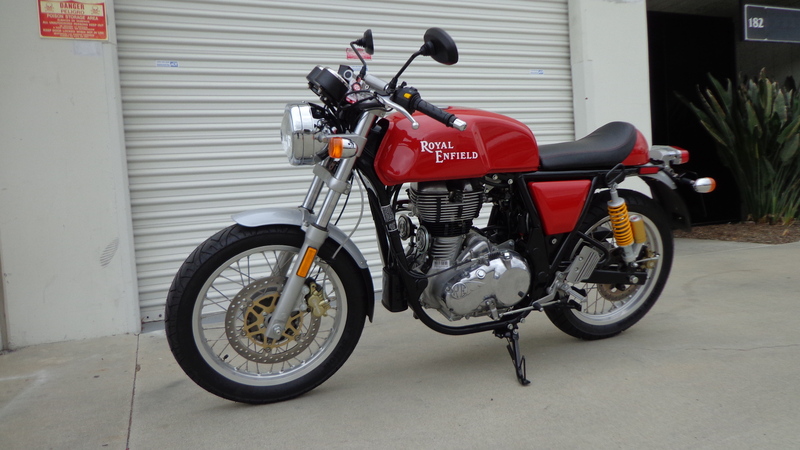 This has so much appeal to the public, Girls will really dig it as it has kick start and electric start and is a light weight machine and a lot lower than even the Thruxton. So take the bike with a pinch of salt and with some Mods, this machine can fly- Remember, this is a New production and I guarantee you will see fast ones on the road later in the year. Plenty of these have been made but it has taken a long time to get to my shores of Sunny California as the emissions here are tighter than anywhere in the globe. 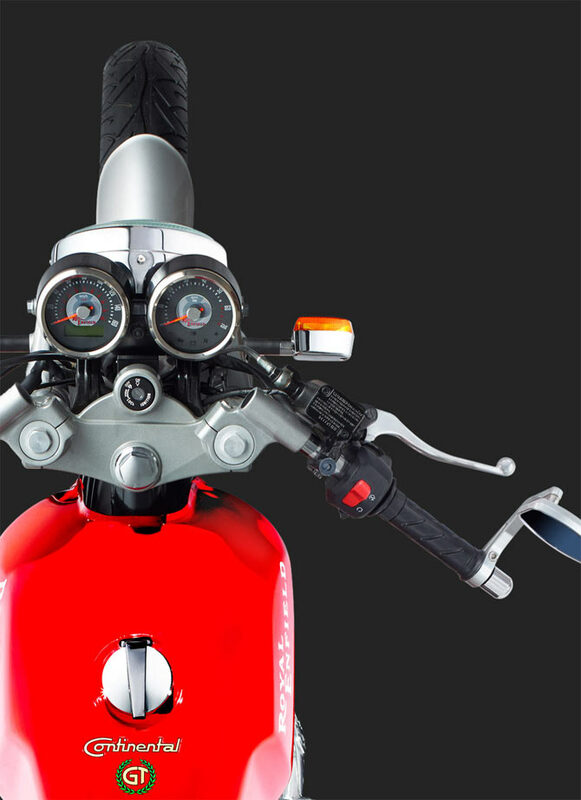 What is cool is that the front end has a single disc rotor and has been blessed to adorn a Brembo set up that will make sure that you stop when you really need to. These have been out back home for almost a year I guess and today I was happy to get the phone call to come and get mine. 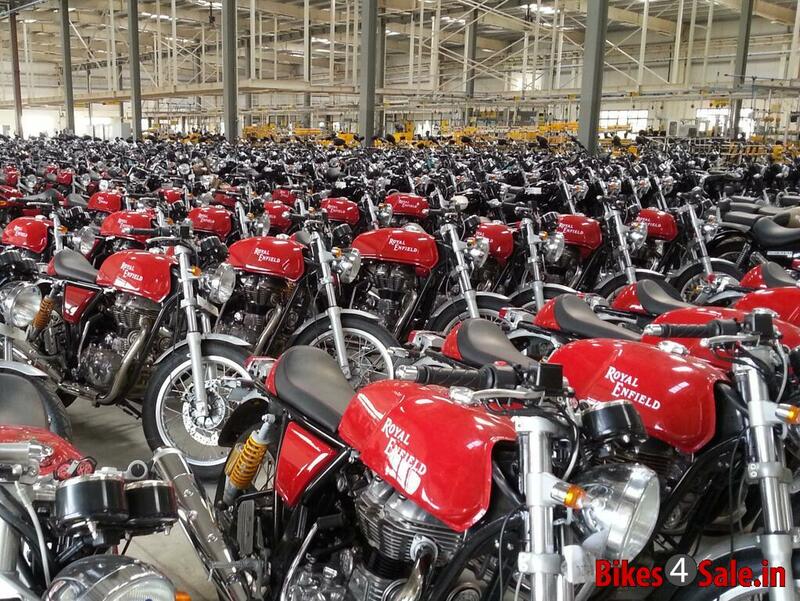 These machines shout out at the world that Royal Enfield is back and I for one are grateful that the risk they took was a solid one. 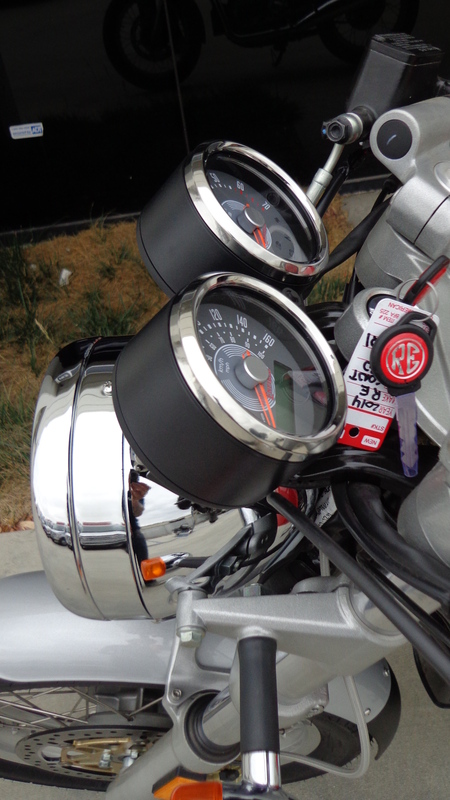 I was so surprised to see that these are even equipped with a set of Paoli Piggy Back shock absorbers, another cool addition to this bike. 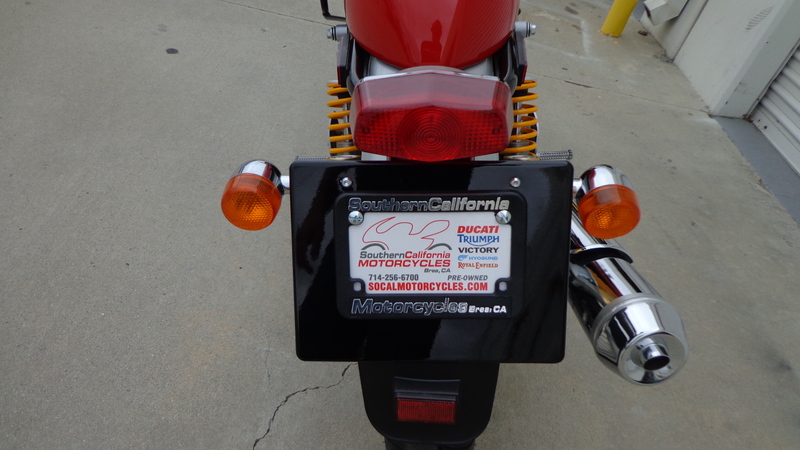 This has a kick starter and an electric, so no more embarrassing stalls at the traffic lights. The bike is a great little design and this has the New Harris Performance Twin Down Tube Cradle frame that was meticulously re-engineered back home in the UK. The gas tank is 13.5 litres so should do quite well on a road trip and at 365 Kg this is nt a heavy bike at all and that opens to door for many riders, especially those who are shorter and have had problems with other machines. 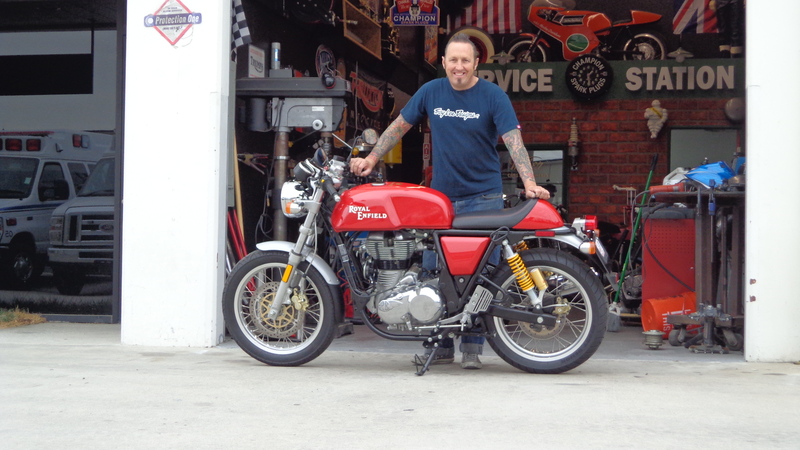 The exhaust is awful and one of the first things that i am going to change is this and we will be making our own systems, as well as other cool parts to improve some of the looks to change the Modern styling to a little more Cafe look. 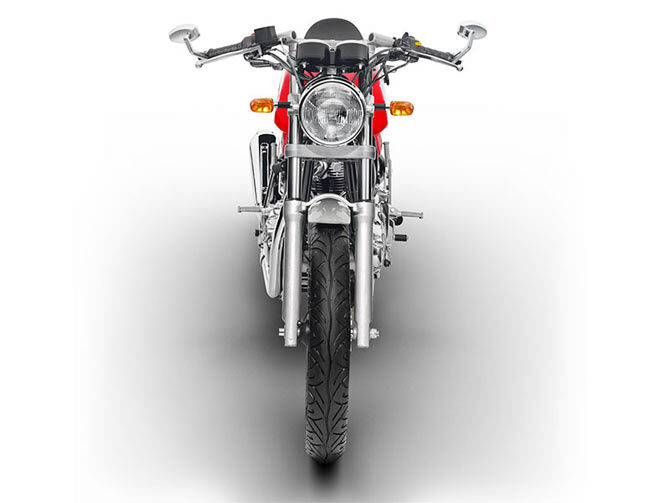 These have got to go, the massive European style license plate backing, the hideous turn signals will get more classic styling ones and of course the rear fender will be poo canned and have a short rear end as the bike will look way better like that. I will also be removing the headlight as it is too bulky and shall fit one of our very own models to give a wee bit more finesse. Also, the front fender needs to be shortened and that’s easy as the mud flap screws off but shall be making new fenders for this as well. 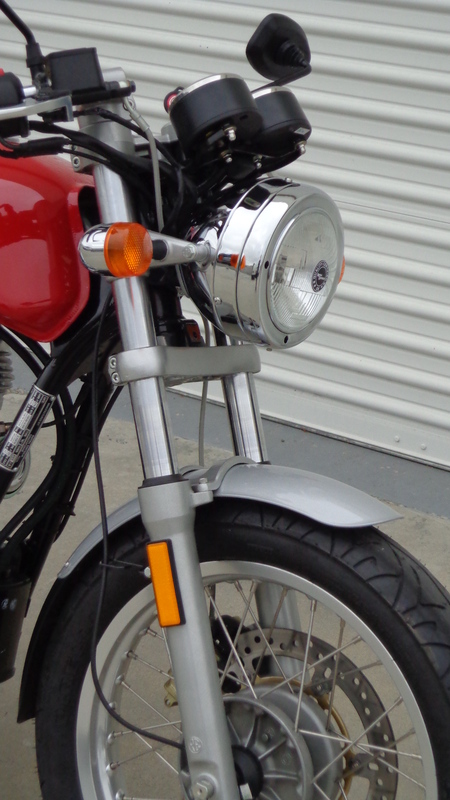 Once the big turn signals are removed and smaller ones fitted, I shall feel better, the UK ones are way better but these ones on here are going this weekend, I actually like the gauges as they remind me of my T100 Triumph Daytona. 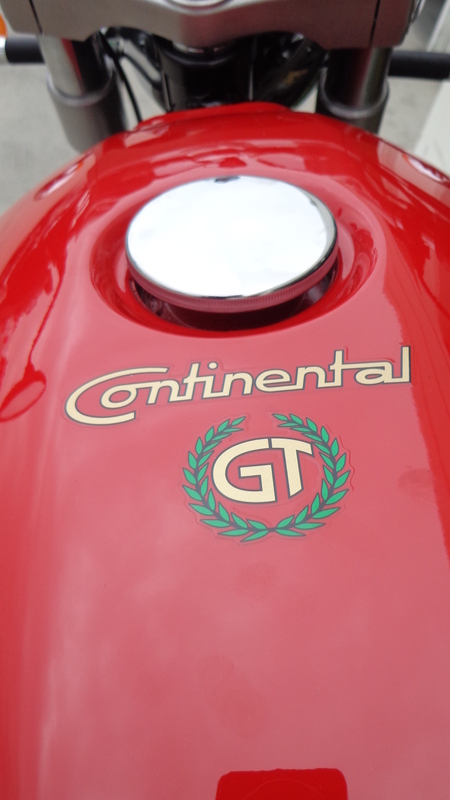 I think that I shall bung some pin lines on it too this week to break the Red up a little, and all my machines have pinstripes somewhere on them. 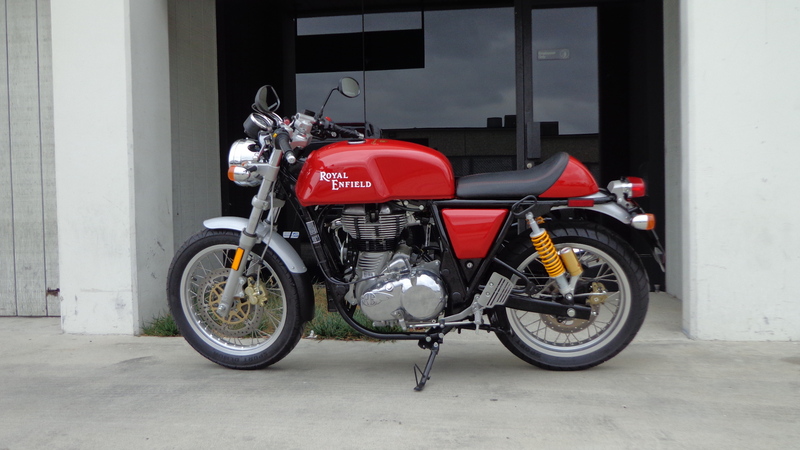 Plenty for me to see and do to personalize my little Red Rocket and be sure to check my blogs on what I do with this bike as I shall be offering the parts that we produce to you lot who have just purchased your Royal Enfield Continental GT. 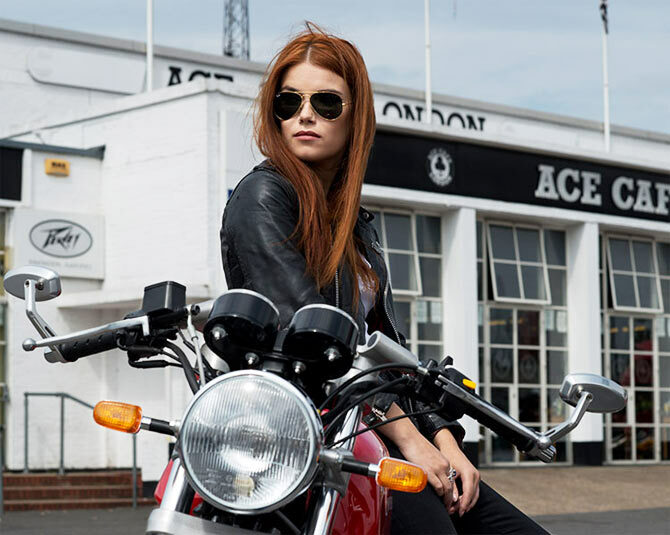 This entry was posted in Blog and tagged 500 RE, 59 club, ace cafe, busy bee cafe, cafe racer, classic bike, north circular, rock n roll, rocker, royal enfield continental GT, ton up, vintage motorcycle. 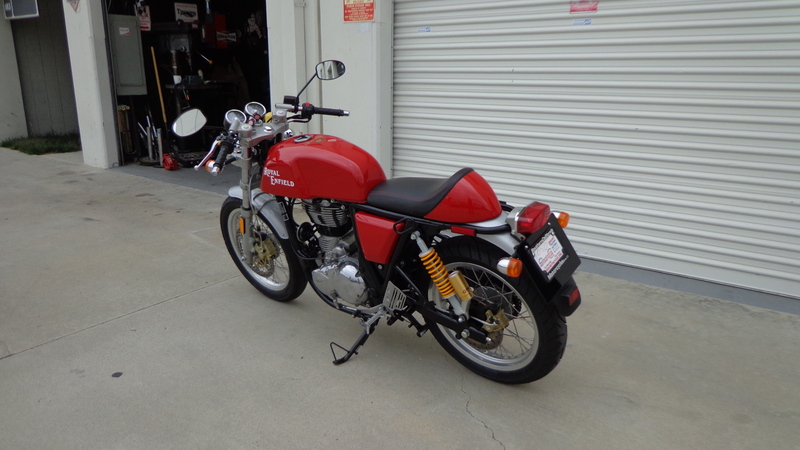 COOL LITTLE CAFE RACER FOR SALE!